You ever go on Amazon and quickly commit to an expensive purchase based on the product's description and marketing alone? Unless you heard from a friend you trust that it's truly worth the purchase, chances are that you probably want to do a bit more research. In many cases, companies have products and services available, but no data on what customers think of them (sometimes intentionally). Research shows that 82% of modern consumers consult their smartphone before making an in-store purchase and 45% read reviews from consumers not unlike themselves. They understand that a customer is going to tell it like it is because they don't have the same bias that a sales or marketing department may have. When available, I frequently research customer reviews when I'm deciding on making a purchase for a product of almost any kind. For example, I always check next to the reviews on Amazon for the words, "Verified Purchase," because it's a big world and we can't pretend no business would have the audacity to flood their products pages with faux glowing reviews. When I know someone like me has tried the product and swears by it, I trust it all the more. While I'd hope that everyone trusts and believes in our products as much as we do, we can't convince all the skeptics with what the products can do, but we can show them what is has done for people in similar applications. Every once in a while, we're provided with a unique opportunity to conduct case studies with customers who use our products for all sorts of applications; some we never even imagined. We recently had a "Verified Purchase" customer give us a testimony on our GracePESDs and described the useful application that saved them time and money, but also made their process safer. This facility uses a combination of over fifty Safe-Test Points & Voltage Test Stations to conduct LOTO on CAT II & IV rated equipment, which previously required expensive and bulky PPE. 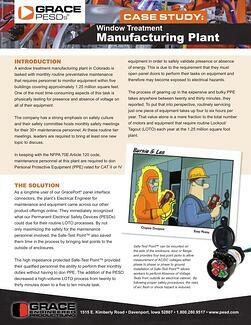 The addition of PESDs mitigated risk to the point where by NFPA 70E standards, no PPE was required any longer. I actually promote [the Safe-Test Point™] frequently. Great product. Recommend for 208V 3-Phase or higher to use these due to the fact that it mitigates the need to get dressed in bulky arc flash shock hazard gear to verify if there is voltage. For general LOTO aspects, this device is a godsend for us. Click on the image just above to view our trade show calendar. This week, we're exhibiting in Phoenix, AZ at Data Center World at booth #513. Stop by and say hello if you are attending! 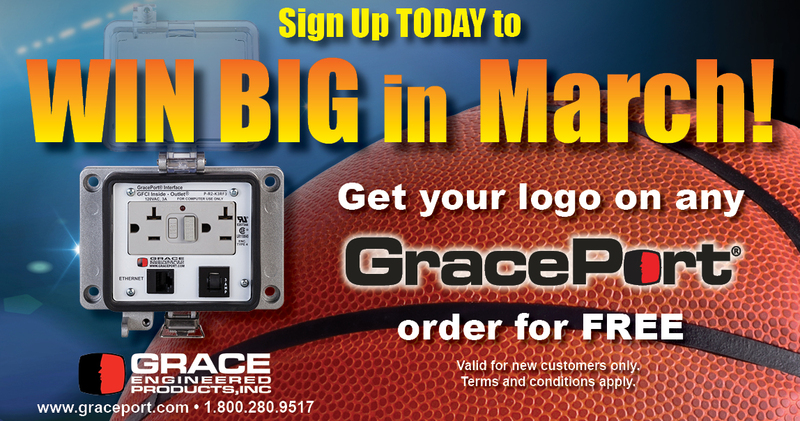 Enter our GracePort March Madness event! All you need to do is submit your info and company logo for your next order to receive free logos printed to the face of your GracePort for life!